I was thinking (It's what insomniacs do a lot of!). We have National Preparedness Month in September. But, we don't we have a National Prepper's Day as well. Why not? Well, my thoughts kept rolling, as did my Google-fu, and I found out how to petition for a National Prepper's Day. So, guess what, I did and here is a copy of what I submitted. Just to be clear, this is not a petition process. The request is submitted and a board reviews the submission and makes a decision within 6-8 weeks. Now, don't get your hopes up, because we all know what many think of us crazy preppers. But, you never know. Regardless we get our day, or not, we can do what we want and celebrate it anyhow. Yep, if they don't give us our day, we'll make it our own anyway. We seek to recognize, Sept 8, the anniversary of the deadliest disaster in US history, the Galveston Hurricane of 1900, which killed upwards of 12,000 people as National Prepper's Day. With that, it is worth mentioning that September is also National Preparedness Month, which ties in perfectly with National Prepper's Day. This tie-in, if granted, will aid in the overall preparedness and resiliency of people who may be otherwise unprepared. 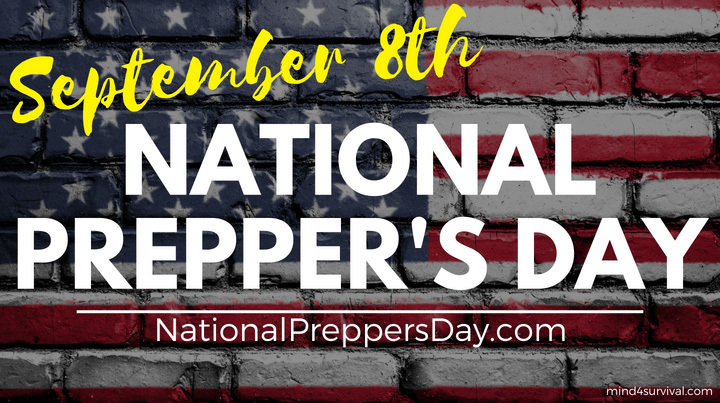 National Prepper's Day will help raise awareness about preparedness and seek to represent everyone who works to be better prepared to overcome emergencies, disasters, and other adversities. "Prepper" is a term that represents resiliency, mindfulness, and selflessness. Preppers are people who develop the skills, mindset and drive to be in tune with the environment and the ongoing world around them, which in turn helps preppers to make better decisions and to be better prepared for the life’s difficulties. 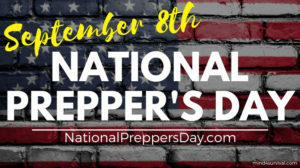 National Prepper's Day will help emphasize the importance of preparedness in everyday life to try and avoid problems before they happen but have the confidence and ability to overcome the problems when avoidance isn't possible. Preparedness may take the form of a personal disaster such as a job loss, home fire, or another tragic event. However, it also represents the ability to prepare for a regional, national or larger scale disaster so as to not be a burden on a potentially strained system but to also to be able to potentially aid others through the difficult time. Being prepared to overcome a disaster is important for everyone. We, as a nation and as a world, have lost too many people who, had they prepared even a little, may have lived rather than perished. Anytime we are able to help even just one person to become better prepared is well worth the investment of time and effort. While preparedness of citizens, on the whole, may be lacking, through efforts such as National Preparedness Month, and the proposed, National Prepper's Day, we will be able to bring increased awareness about this important issue. In doing so, we will improve everyone's likelihood of overcoming disastrous situations in the best manner possible. Preppers are people who work to become more safe, secure, and prepared. Preppers seek to be more mindful of emergencies and the potential for difficult times. Preppers include many types of people. Yes, the Doomsday Prepper types gain the spotlight, but by and large, most preppers are people who want to help themselves and others overcome problems that may range from personal disasters such as job loss to greater emergencies that exceed the authority’s ability. One type of prepper is the ham radio operator who maintains their radios and uses them to aid relief efforts during times of disaster. Another type is volunteer first responders who venture out into dangerous conditions so that others may live. There are people such as the Cajun Navy, who selflessly volunteer to travel through dirty, flood stage, alligator infested waters to rescue flood-stranded pets and families. There are people who, as on 9/11, volunteer to help others because it's the right thing to do. There are people who donate vast amounts of personally saved food to help those who are not as fortunate to have prepared for troubling times. If we look back in time, people who grew Victory Gardens during World Wars I & II, were early versions of today's preppers. The list goes on and on.to handle at the time, i.e., Hurricane Katrina. In the end, it is important to recognize and encourage people to be better prepared to overcome the adversity that life throws at us. By doing so, they ease the strain on local resources to help others so that everyone comes out on top, similar to the focus of National Preparedness Month. After all, as Benjamin Franklin states, "By failing to prepare, you are preparing to fail." Thank you in advance for your time and consideration of National Prepper’s Day. If you have any other thoughts or questions about National Prepper's Day, please leave a comment below. Thanks for your support of National Prepper's Day!